The biggest hurdles for Couch Potatoes are psychological. Here’s how to reprogram your mind for investing success. When Art Johnson started talking to clients about his investing strategy, he used a PowerPoint presentation filled with tables and graphs showing the proven benefits of broad diversification and low costs. It seemed like a good idea, but it didn’t work. 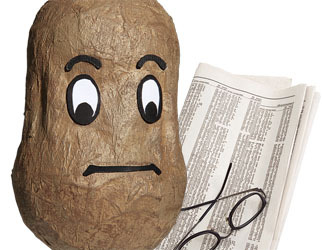 For years now, the portfolio manager with ScotiaMcLeod in Calgary has used a strategy similar to MoneySense’s own Couch Potato. The model has great appeal: it’s simple, cheap, and it routinely beats the pants off of most actively managed mutual funds. But as Johnson soon learned, no matter how compelling the data, Couch Potato investing can still be difficult. The problem isn’t the math: it’s the mind. The evidence supporting index investing is overwhelming. According to the most recent data from Standard & Poor’s, a mere 2.5% of actively managed Canadian equity funds outperformed the market during the five years ending in 2010. Bond index funds have an even more impressive track record, since it is extremely difficult for any bond manager to add value after costs, especially in the current era of low interest rates. There will always be examples of fund managers or individual investors who trounce the indexes, of course, but these are rare and impossible to identify in advance. Index investing gets a lot easier once you become aware of the obstacles your brain will throw in your path. Here are the most common psychological hurdles you’re likely to face when you adopt a Couch Potato strategy, and some expert advice on how to leap over them. Couch Potato investors are not immune to this: we heard from many who adjusted their portfolios last year to include more Canadian stocks, or bonds with shorter maturities, because they were convinced these moves would earn them better returns than our “old portfolio.” Yet despite the sluggish economy south of the border, U.S. stocks dramatically outperformed Canadian ones in 2010. And who could have predicted long-term bonds would return almost 18% last year? No one, of course, and that’s the point. Our Global Couch Potato includes broad exposure to Canadian, U.S. and international stocks in all sectors, as well as bonds of all maturities. We don’t adjust the mix based on current market conditions, and it’s not because we’re too dim or too lazy. It’s because when the future is unknowable, the wisest move is to own a little of everything all the time. For both men and women, stock picking holds out the promise of a big payoff, and your brain feeds on that kind of anticipation. The promise of financial reward causes your nucleus accumbens (the brain’s reward centre) to go haywire. Index investing, on the other hand, is about as stimulating as a four-hour lecture by an actuary who mumbles. If you genuinely love the thrill, there’s nothing wrong with engaging in a little stock picking. Hallam, for one, strongly recommends indexing, but doesn’t think it needs to be all or nothing. However, he suggests limiting your stock picking to 10% of your overall portfolio. Switching from high-cost mutual funds to a low-cost Couch Potato portfolio can boost your long-term performance by one or two percentage points all on its own. That’s a big deal—but it’s not enough to ensure financial success. There are several factors that determine your success as an investor, and the two most important are how much you save and the number of years you take advantage of compounding. But we don’t get any adrenaline rush from these. Instead, we tend to focus on the one factor we can’t control: our investment returns. We’ve noticed this tendency among many young and aspiring Couch Potatoes who worry about saving a few basis points in fees, or agonize over the ideal asset mix, even though they have very small accounts. For now, these investors should focus on saving more, rather than on squeezing out an extra 1% from their portfolios. The fine-tuning can come later. The same emotions take over when it’s time to rebalance your portfolio, which means selling some of the best-performing asset classes and adding money to those that have gone down the most. Your brain doesn’t want you to do that. “Anyone who reads the paper doesn’t want to buy anything in Europe now because of what is happening,” says De Thomasis. “But there has never really been a period when people felt everything was peaceful and it was a great time to invest.” When recent returns have been poor, investors fear more of the same. When the markets have been kind, people worry everything is overvalued and due for a correction. Art Johnson calls this “the amygdala hijack.” The amygdala (actually we have a pair of them) is an almond-shaped structure that acts as the brain’s panic button: it made your caveman ancestors duck when someone swung a club near their heads, and jump back when they stepped near a snake. It also makes you get sweaty palms at the prospect of losing money. That said, if you’re terrified about investing a lump sum all at once, it’s perfectly fine to do so gradually. “Normally with large amounts, we will ease in over six to 12 months,” says De Thomasis. But again, follow a set of rules, such as investing one-quarter of the lump sum every three months. A dozen years ago, being a Couch Potato was difficult, because there were very few index-tracking funds available. Today Canadians have an embarrassment of ETF choices, and it’s extremely easy to build a customized portfolio at rock-bottom cost. But in some ways all of these choices have made investors lose their way. When MoneySense introduced the Global Couch Potato in 2004, the only ETFs available were broadly diversified, cheap, and passive—indeed, those three qualities were the basis of the strategy. Now the market is filled with ETFs that are extremely narrow, expensive and actively managed. These may be useful for some investors, but they have nothing to do with being a Couch Potato. If you’re just able to earn market returns over your investing lifetime, you’re likely to outperform about 90% of professional money managers—let alone your brother-in-law or the guy at your kid’s hockey game. But you will never be number one in any given year, or even any period of several years. You can always find a strategy that would have worked better in the recent past (gold, anyone? ), and that can make humble Couch Potatoes feel like chumps. Part of the problem is that we’re conditioned to think that simple solutions are unsophisticated. Index investing doesn’t require studying company balance sheets, writing call options, positioning yourself on the yield curve, or any of those other things that might make active investors sound smart. These folks will often remark that the Couch Potato “is fine for people who aren’t able to do the research.” That’s nonsense: the point is that their research usually adds no value. “What may seem simple can be elegant and very sophisticated,” says Frank Danielson. It may help to know that many of indexing’s staunchest advocates are finance professors with Nobel Prizes on their mantels. Academics may not use the term Couch Potato—they’re more likely to talk about “mean variance optimization” and “the efficient frontier,” which sounds way smarter—but they overwhelmingly favour passive investing. That’s because they focus on the data, not the anecdotes about investors who beat the odds. When you adopt the strategy, count yourself among the smart money. MoneySense brought the original Couch Potato portfolio to Canada in 1999 and created the Global Couch Potato in 2004. During the decade ending in 2010, the Global Couch Potato outperformed more than 85% of comparable balanced mutual funds. You can build your own Couch Potato portfolio by opening an online discount brokerage account and purchasing the ETFs directly. But brokerages charge a commission (usually $10) every time you buy and sell ETF shares. So if you contribute frequently, or if you have a small account (less than $30,000 or so), it is more efficient to use TD’s e-Series index mutual funds. These have slightly higher annual fees, but they do not incur trading commissions. They can be purchased online with a TD Mutual Funds account or through TD Waterhouse, the bank’s discount brokerage. The Global Couch Potato portfolios below use a conventional mix of 60% equities (divided equally among Canada, the U.S. and international) and 40% bonds. You can adjust this allocation to suit your own needs: conservative investors may want fewer stocks, while aggressive investors can opt for more.